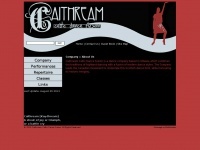 Caithream Celtic Dance Fusion is a dance company based in Ottawa, which combines the traditions of highland dancing with a fusion of modern dance styles. The Company leads the Canadian movement to modernize this Scottish dance form, while honouring its historic integrity. The web server used by Caithream.ca is located in Canada and run by Bell Canada. This web server runs a few other websites, mostly in the english language. The websites were created using the programming language PHP and they are hosted on a Apache server, which runs on the operating system Debian (Linux). Due to the robot information on the webpage, the following actions by webcrawlers are not allowed: archiving the website. All other actions by webcrawlers are allowed. The homepage of the website is "/en/".